The Sanxingdui Museum is located in the northeast corner of the ruins of Sanxingdui, which is at the bank of Duck River in the west of Guanghan City, Sichuan Province, known as a famous historical and cultural city. 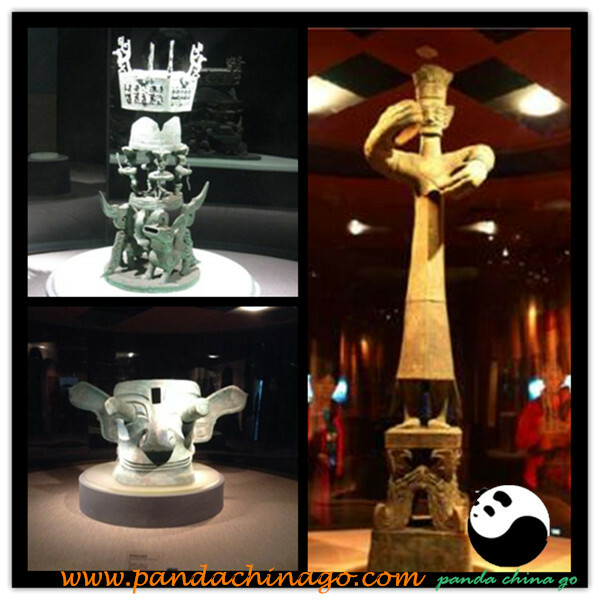 It is 38 kilometers north from Chengdu,and a large modern thematic museum. Sanxingdui Museum covers an area of about 33 hectares of which the afforested area is over 80%. There are two exhibition halls in the museum, including the First Exhibition Hall and the Second Exhibition Hall. The display area is nearly 12000 square meters. The First Exhibition Hall exhibits gold, copper, jade, stone, pottery, etc. while the Second Exhibition Hall is specially used to exhibit bronze. The Sanxingdui remains are composed of several large relic areas. 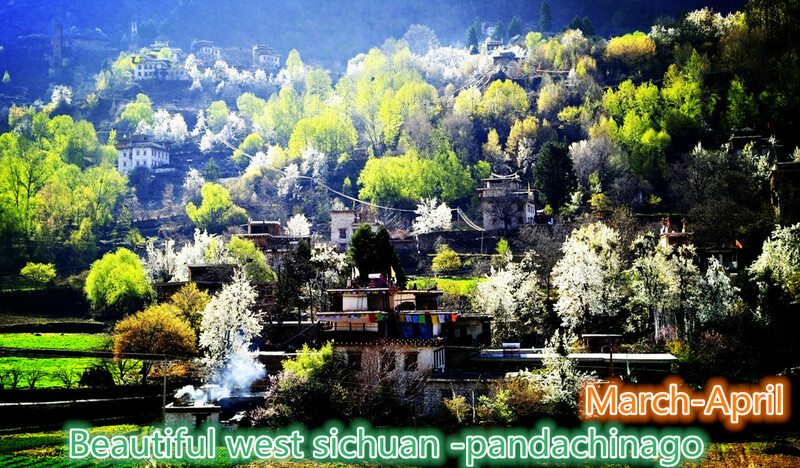 The areas are the largest, most important and elegant ancient Shu cultural relics sites in Sichuan. The remains cover 12 square-km in total. Life went on here about 2,800 to 4,800 years ago, equivalent to the late Neolithic Age. The remains include six places: Sanxingdui on the south bank of Mamu River, the Moon Bend (that is, the tableland between the Mamu River and the Duck River), Shi Zinao to the east of the remains, Hen Liangzi in the west, Xi Quankan on the south bank of the Duck River and Dongsheng temple. The six areas belong to the central remains adapting a division of labor and social relationships. The areas are "Sanxingdui ancient country" encircled with city walls in the east, west, and south. This was just the remote Kingdom of Shu. The identification of the ancient city of Sanxingdui has unveiled the mystery of history and clearly revealed to the people the glory of the ancient capital of the Shu kings, and it once again proves that the place was once a glorious centre of civilization in the ancient east. It has made up an important cultural gap in the evolutionary development of the Chinese culture and as an ancient pearl displayed by colonization it also occupies its place in the history of world civilization and human development. The Sanxingdui site and thousand of cultural relics of Shang Dynasty unearthed from which such as earthen wares, jade articles, bone articles, gold plates and bronze wares are displayed. The cultural relics of the Sandingdui are the most influential, the most valuable and the most fascinating relics among the tremendous amount of cultural relics of China. The exhibition has many breakthroughs and novelties in terms of content and art forms in order to exhibit the large quantity of cultural treasures of Sanxingdui at this mysterious and dreamy art palace. The discovery of Sanxingdui shocked the world, but the history of the ruins remains a mystery. The bronze wares from the Sanxingdui we see today are but only small scraps of an immemorial and brilliant civilization. Where was the Sanxingdui culture from? Which clan did the residents of the ruins belong to? How did the advanced bronze manufacture techniques come into being? And how did they decline and die out? The archaeological project at the Sanxingdui ruins is ongoing. Mysterious and magnificent, the Sanxingdui civilization is a unique and dazzling page in China's long history.